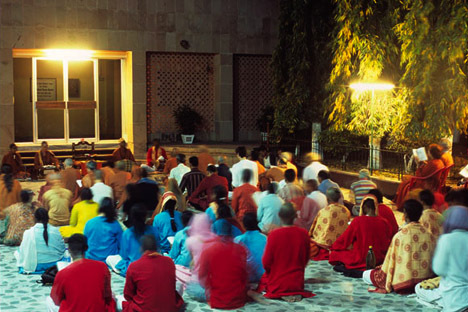 Our schedule follows the ashram life – early to bed, early to rise and always inside the ashram. Our visit to the Bihar School of Yoga was announced quite late (too late), and this Monday we were busy trying to catch Swami Suryaprakash, the director of the Bihar School of Yoga, for an interview. In the afternoon, he finally gave us one hour of his time, and our research work could start. In the late evening, after the kirtan (devotional singing), we were granted the photo permission – wonderful news! We went to bed with a big smile.